R&R Lotion SD-4-ESD Solvent Dispenser 4oz. 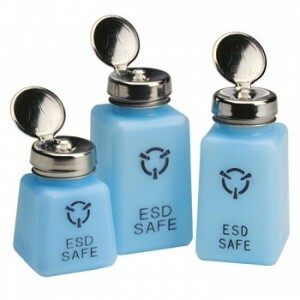 - Standard Pump - ESD Safe - Blue. Does NOT contain Exthoxylated tertiary amine... See: Additional Product Information. The R&R Lotion SD-4-ESD is a 4 oz., ESD-safe solvent dispenser with a standard pump. R&R Lotion has developed a new process of molding polyethylene bottles with a concentrate that does not contain "ethoxylated tertiary amine," which is widely used as an anti-static agent. These ESD-safe bottles have an average surface resistance of 109 to 1010 and do not have the undesirable features associated with surfactant-laden material. The bottles dissipate a charge of ±5,000 volts in less than two seconds at 40% RH! By their chemical nature, the bottles do not have any chemical reactivity with such solvents as TCE or alcohol. The pH of the DI-water solutions tested was the same before and after a seven-day period. No color change, or any other physical changes, were noted for any of the solvents tested.